If you've seen the epic movie, you probably think Doctor Zhivago by Boris Pasternak is a love story. That's not quite true. Although there is a love story, it's mostly a man's love for his country. A member of the gentry, Yuri Zhivago is orphaned after his mother dies and his millionaire father commits suicide. He ends up living with his aunt Anna and her family including his cousin Tonya. Yuri and Tonya eventually marry and though he loves her very much, circumstances soon part them. Yuri is conscripted into the Great War where he meets the enigmatic Lara. Lara is no stranger to Yuri. He has seen her a few times throughout his childhood under odd conditions. Lara has had a difficult life. As a young girl she fell under the influence of a lawyer who used her. Lara never got over it. She marries Pasha, a boy who adores her, and they move to the country to become schoolteachers. When the war starts, Pasha leaves Lara to join the army. She becomes a nurse in an effort to find him. Unbeknownst to Lara Pasha is now a revolutionary leader. When Yuri is reunited with Tonya, the Revolution is upon them. With conditions in Moscow disintegrating, Yuri and Tonya run to the country near the town where Lara is now living. Yuri and Lara meet again and have an affair, until Yuri is forced to join the revolution. When he finally escapes, he finds Lara but no Tonya. Tonya, heartbroken by Yuri's disappearance, has fled to Paris. Yuri is a wanted man and decides to spend his last days with Lara but fate has other plans. Believe it or not, that is a simplified synopsis of Doctor Zhivago. There are dozens of characters that Yuri interacts with and each has their own story. Throughout the book Yuri meets these people over and over again. Some will help him, some wish to do him harm. It's a complicated book that took me ages to read but I think it was worth it. Not only is the language a difficulty in reading Dr Z but the history of the Russian Revolution is overwhelming. It was hard to keep track of who was doing what. There is a real sense of civilization breaking down. No one trusts anyone else, people drop everything to go into hiding. Families are separated, people 'disappear'. All is chaos. At one point, Yuri is walking to Moscow and all around him the fields are abandoned and teeming with mice. The forest is a refuge. He believes that the fields are the Devil and God is the forest, like humanity has gone back to primitive times. The book is dripping with symbolism and even though most of it goes over my head, I do believe that the women in Yuri's life represent Russia. Tonya: tradition and stability, the old Russia; Lara: the Revolution, Russia in transition, she loves both a revolutionary and a gentleman; Marina: new Russia, a peasant, Yuri is resigned to her but doesn't really love her. In fact, Yuri's attitude changes throughout the novel. At first, he embraces the changes but at the end he sees the hypocrisy and it destroys him. He gives up but he never leaves his country. "We'll speak to one another once again the secret words we speak at night, great and peaceful like the name of the eastern ocean. It's not for nothing that you stand at the end of my life, my secret forbidding angel, under the skies of wars and turmoil, you arose at its beginning under the peaceful skies of childhood." *Sigh* It was passages like that that kept me going, through the horror and depressing scenes. It's not a happy book but it is worth reading. I read this during a cold and snowy January. Perfect atmosphere weather. It's a great book for curling up with in the winter. Complex and beautifully written. It was work to get through at times, ,but I'm so glad I read it. Wonderful review. Did you read this with Classics Club. It sound like a book that would help if there was discussion while reading it. I wonder if there are better interpretations of it? I saw the movie when I was fairly young. At times, this book did feel like work while I was reading it. It was so hard to keep track of everyone, read slowly enough to absorb the poetic language, and "get" some of the literary meaning at the same time. Plus I constantly wondered what the original Russian said. I studied it for 5 1/2 years in high school, not enough to be able to read a novel, but probably enough that I could judge the translation. Sounds like a beautifully written book! Thanks for sharing your thoughts. Good for you for reading this book. That takes serious dedication. And thanks for the great review, too. I grew up watching that movie and loved the soundtrack. I've always wanted to read the book but it's a bit daunting. Thanks for the review! I have never heard of the book OR the movie! Sounds interesting! This is a book I wish I wanted to read! I doubt I ever will, unless one of my book clubs selects it, but I enjoyed reading your review, and considering it once again. Oh man, Chris! You are totally perpetuating my fear of this book and Russian literature in general. :) The language, the symbolism, the hard passages and subject matter. I plan on reading this one sometime this year, so I'll just have to be brave and throw myself into it (haven't seen the movie either). Glad you found it worthwhile in the end. I agree with your review, especially with his symbolic use of Zhivago's 3 wives. The entire time I was reading this book I had to keep in mind the seriousness of the poet writer Pasternak and the price he paid to publish this book--this is his story of his love for a troubled Russia. 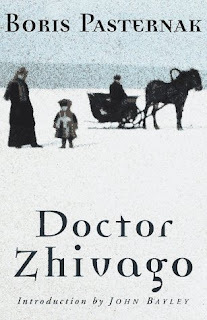 It's not about lost love between Zhivago, a man, and the women in his life, as women.